The U.S. Food and Drug Administration (FDA) recently announced a three-year deadline for the elimination of artificial trans fats from the American food supply. This long-awaited measure is expected to prevent 20,000 heart attacks and 7,000 deaths from heart disease every year. The present article will discuss the health threats posed by trans fats as well as the implications of their imminent elimination. It will further present the R&D tax credit opportunity available to support the food industry during this important transition. Artificial trans fats are formed when vegetable oils are chemically stabilized and solidified by adding hydrogen. These chemical products, which are now common ingredients in processed and fried foods, were first introduced to American consumers in 1911, when vegetable shortening Crisco entered the market. Since then, trans fats have become major contributors to heart disease in the United States. Scientific efforts have overwhelmingly demonstrated the artery-clogging properties of trans fats, which raise the levels of “bad” cholesterol and can reduce levels of “good” cholesterol. According to the Institute of Medicine, there is no safe level for consumption of partially hydrogenated oils, the primary source of trans fats. The presence of trans fats in the American food supply has been considerably reduced over the last years, particularly since 2006, when the FDA required the inclusion of trans fat content information on nutrition labels. However, they remain a part of many Americans’ diet through the consumption of popular products such as frostings, microwave popcorn, packaged pies, frozen pizzas, margarines, and coffee creamers. In addition to cardiac implications, trans fats have been linked to other health conditions, including obesity, diabetes, and, surprisingly enough, even memory loss. A study by Dr. Beatrice Golomb, a professor at the University of California, San Diego School of Medicine, demonstrated that the ingestion of trans fats can actually affect brain function. As a result of comprehensive evidence pointing to the harm caused by trans fats, the FDA ruled that partially hydrogenated oils, which are the primary dietary source of industrially-produced trans fatty acids, are no longer “generally recognized as safe” for any use in human food. The agency estimates the cost of industrial trans fat elimination by 2018 to be around $6 billion while the savings it will generate in healthcare and related costs, will amount to over $140 billion in 20 years. Completely removing artificial trans fats from food products in three years will be undoubtedly challenging for the food industry. Due to their low cost and their ability to lengthen shelf life, chemically hydrogenated oils have long been the preferred choice of many food manufacturers. Their replacement will require adjustments in production and product formulation. In the case of baked goods, for instance, the use of alternative shortening options with softer texture may require temperature control and consistent ingredient rotation during storage. As a result of labeling requirements and increasing public awareness some companies have preemptively reformulated their products to reduce or eliminate trans fat content. The experience of these pioneers can shed light on the best way forward. Many fast food chains have successfully migrated to trans fat-free products in recent years. In 2007, Dunkin’ Donuts started a voluntary reduction of trans fats that resulted in the reformulation of over fifty menu items, including its donuts, which now use a combination of non-hydrogenated oils. McDonald’s has also significantly reduced artificial trans fats in its menu. The company switched to a healthier cooking oil that enables many of its fried products to be labeled trans fat-free. Since 2008, American multinational manufacturer and marketer of branded consumer foods General Mills has reduced trans fats in 350 products. 95 percent of the company’s U.S. retail products are currently labeled zero grams of trans fat. Following the announcement of FDA’s new trans fat labeling laws in 2006, Kraft Foods Group reformulated 650 items, leaving only 2.5 percent of its food products with an amount of trans fat worthy of a label. The company replaced trans fat oils with proprietary blends of oils. Throughout the country, food industry suppliers are engaged in developing innovative alternatives to partially hydrogenated oils, including liquid and solid oils, oil blends, palm oil fractions, and enzymatic interesterification. Headquartered in San Francisco, California, biotechnology company Solazyme is the creator of AlgaVia, an innovative line of ingredients made from a native microalgae strain capable of naturally converting sugars into oils and protein. The company’s portfolio of AlgaWise oils combine high stability, zero trans fat, and reduced saturated fat. In addition to offering extended shelf life, algae oils are particularly suited for frying and can replace partially hydrogenated oils in products like dressings, potato chips, and mayonnaise. In the case of baked foods, which need more structured fat, the combination of liquid oils and palm oil or enzymatically interesterified oil (*see picture 1) are promising alternatives. According to Roger Daniels, vice-president of research and development and innovation for Memphis, Tennessee-based Stratas Foods, there is an ongoing trend towards the “return to traditional sources of fats coupled with high-oleic oils.” He argues that advances in functional crystallization processing are expected to be increasingly exploited to achieve bakery shortening alternatives. Headquartered in Saint Louis, Missouri, Bunge Oils has created a line of enzymatic solutions that eliminate trans fat and optimize saturated fats. With a wide plasticity range, the UltraBlends enzymatic products include four types of shortenings and a specially formulated baker’s margarine. The innovative solutions are based on a process called enzymatic interesterification, which consists in rearranging fatty acids to provide structure and functionality at room temperature. DuPont Pioneer’s new Plenish soybean is yet another example of innovation for the elimination of trans fats. Using genetic modification, the company aims to benefit both farmers and consumers. The high yielding soybeans have an oleic content of approximately 75 percent, the highest of any soybean under commercial development. As a result, Plenish soybean oil offers high heat stability, which is an advantage in frying and baking. Pioneer argues that Plenish performs like hydrogenated oils with none of the health risks. In addition to offering the same health benefits of olive oil, its use also extends the shelf life of manufactured baked goods. 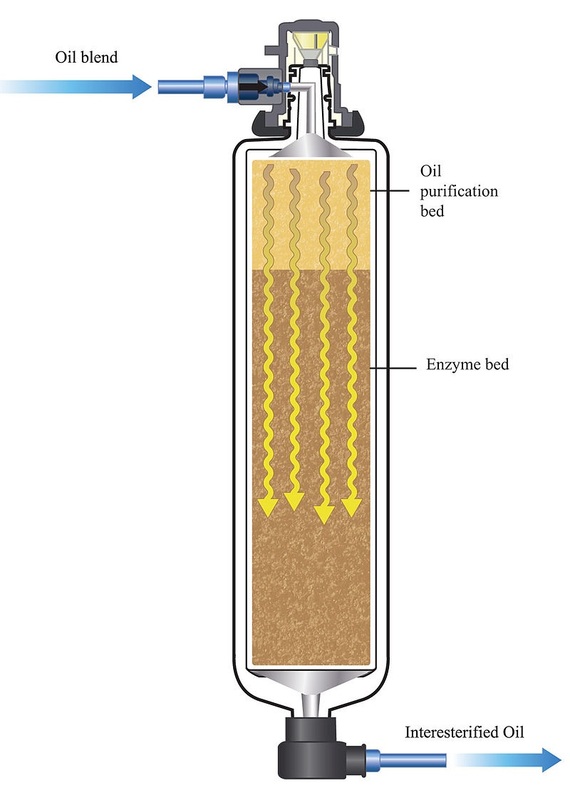 The image below demonstrates a Fixed Bed Filtration System showing a blended liquid oil and solid (hard fat) oil flow through a system consisting of an oil purification bed and an enzyme bed. The food industry must watch out for this unexpected link between trans fat elimination and environmental concerns, particularly in a context of increasing supply chain sustainability requirements. Innovation is the only means to conciliate regulatory, health, and environmental demands in an ever-evolving market. Recent artificial trans fat elimination efforts shed light on an ineligible new priority for the food industry: to make their products more healthful. New standards are a response to overwhelming scientific data as well as to increasingly health-conscious consumers, a combination that could easily lead to further measures targeted at other dietary villains, such as saturated fat. Innovation is the only way food companies will be able to adapt and remain competitive in this changing environment.